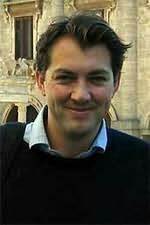 James Holland was born in Salisbury, Wiltshire, and studied history at Durham University. A member of the British Commission for Military History and the Guild of Battlefield Guides, he also regularly contributes reviews and articles in national newspapers and magazines and appears on national radio. "Extremely funny... very moving. The research is exemplary, and like the best historical fiction, woven seamlessly into the narrative. Truly compelling." "Gripping, beautiful, tragic and shocking."